Lighter, faster, cooler, the Ultra Race 4.0 in flat-design competition is designed for triathletes looking for a lightweight shoe with a tailored fit. Zoot has developed in collaboration with the perfect partner BOA lacing system with 360-degree fit, which provides in exchange for speed zone advantages. 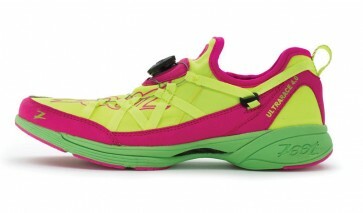 This unique system and the TekSheen's engineered uppers of the shoe owes the most dynamic fit around the running world. Carbon Span + for powerful rolling. Less weight, better shock absorption. The lightweight Z-Bound midsole gives more energy, thus reducing stress and fatigue. Lighter, stronger and faster. Increased ability to control, for more power and for effortless propulsion. Saves you a lot of valuable time. Turning the Boa lacing the wheel is tightened evenly. Ensures a comfortable and secure fit.